As well as christmas I've had another small distraction to sort out, the tender. 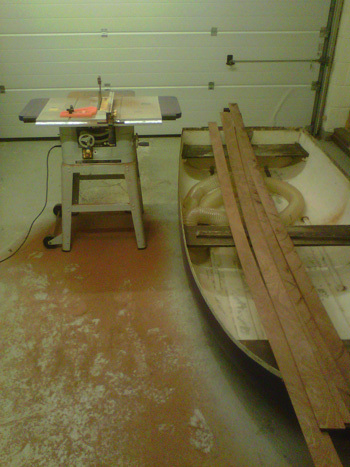 We inherited this small rowing boat with the house and have been using it for many years while it slowly fell apart. It wasn't in great shape when we got it and it certainly isn't now. 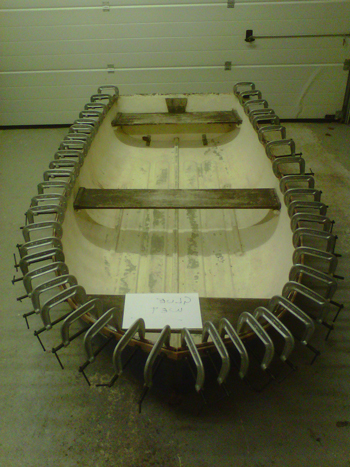 It's a simple fiberglass pram dinghy and the hull is in great shape but all the reinforcing timber is rotten or missing. So the first job was to remove what remained of the old timber sheer, clean up the hull and fit a new one. Fortunately a good friend had a suitable piece of timber which I could use. So I got the old saw bench out and set to work. First task was to make the laminates for the new sheer, 4 off 30mm x 6mm. These were then laminated into position and cured off over christmas.